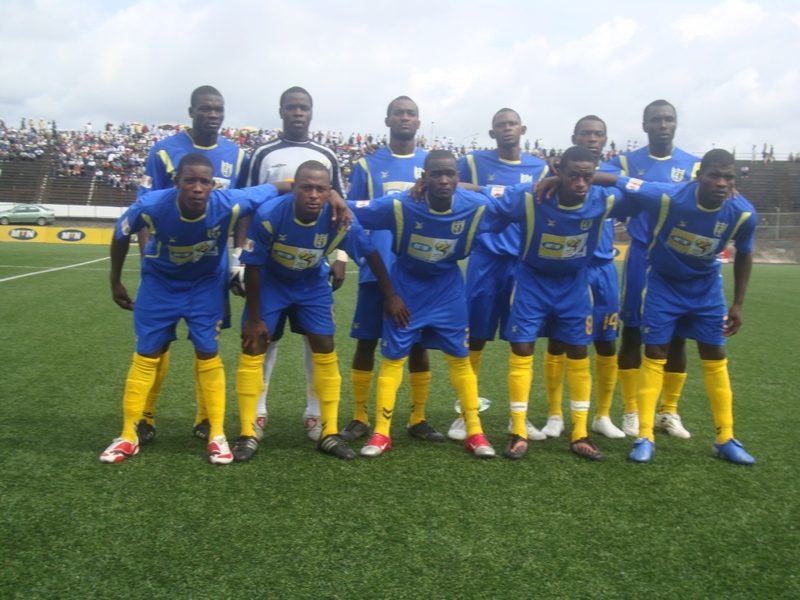 Sable FC, a modest club from Batié in the western parts of Cameroon, is currently number 9 in the MTN Elite One 2010-2011. Sable FC has won the Cameroonian title once, in 1999, but has been fighting hard against relegation the last couple of seasons. The picture is of the Sable FC team and is taken from lechabba.com. Sable FC has two of the most talented goalkeepers in the MTN Elite One. Thierry Tangouatio (born 04.05.1992) is currently first choice. Tangouatio was a much hyped goalkeepers two years ago, when several media reports suggested that Arsenal FC of England was following the youngster. Tangouatio is a former member of the Cameroon U-17 national football team and has recently been training with Cameroon U-20. Earlier this month he was also named in the squad of the Cameroon U-23 national football team. It is not often a 18 year old goalkeeper is first choice at a top level club in the country. The backup goalkeeper is Franck Olivier Zibi, who was involved with the Cameroon U-20 national football team in 2009. Basile Baba (born 10.09.1984) is a tough defender and a true leader on the pitch. Baba is the captain of the team and arguably the most important player of Sable FC, especially when key central defender Eddy Boyom (born 12.12.1983) decided to join Recreativo do Libolo in the Angolan league in January 2011. Boyom will be sorely missed. The speedy Audrey Nyakwe is a regular player in defence. Sable FC has high hopes for defensive midfielder Elie Kalawe (born 28.06.1992). Kalawe can also play as a central defender. Harry Ako and Devaloix Ngako Deutchoua (born 14.07.1987), formerly of Astres Douala, are both key midfielders, often found on the wings. Ngako Deutchoua was part of the Cameroon B national football team in 2010. Right-winger Aristide Jordan Kouayep Tiéko, formerly of Matelots de Douala and Union Douala, is a talented player who has received great reviews. Kouayep Tiéko is most likely born in 1989. Samuel Bitte (born 23.04.1986) and Marius Tresor Epane have both been almost ever present this season, playing as midfielder and defender respectively. Bitte was part of the Cameroon B national football team in 2010. Creative midfielders Nasako Mosina Mopi and Loïque Kuate Souop (born 12.12.1990) have been two of the revelations of the season. Kuate Souop, formerly of Achille FC de Yaoundé, was recently added in the squad of the Cameroon U-23 national football team. Mark Kipeh Pangwoh, presented in my post from 29.03.2011, is the star striker of the team. Pangwoh scored two goals for the Cameroon U-23 national football team on 27.03.2011 against Tanzania in a qualifier for the 2012 Summer Olympics. Thierry Ouega Kamgang and Roméo Yopa are good options for the role as Pangwoh’s striking partner. Ouega Kamgang was part of the Cameroon B national football team in 2010. Four different players have scored two league goals this season: Basile Baba, Nasako Mosina Mopi, Mark Kipeh Pangwoh and Roméo Yopa. Sable FC will be hoping one of them steps up and become the leading scorer at the club, hopefully Pangwoh. Scorpion de Bé is a newly promoted team from Garoua, the capital of the North Province of Cameroon, and the hometown of Cameroon’s top club Cotonsport FC. Being the “baby brother” of Cotonsport FC, Scorpion have several former players of the current league leaders. Scorpion will fight hard to avoid relegation from the MTN Elite One 2010-2011 and is currently number 12 in the league. Sadjo Sodea (born 01.02.1983) is the experienced first choice goalkeeper at the club. Bouba Aminou and Janvier Weleme were both fringe players at Cotonsport FC in 2009-2010 but are now important members of the Scorpion team. Especially Aminou, a talented defender who was part of the Cameroon U-20 national football team in 2010, is a player to watch. Another player who has benefited from leaving Cotonsport FC and joining Scorpion is defender Golopo Bambara (born 03.01.1990). Bambara is currently part of the Cameroon U-23 national football team. Telli Tchoafine Pade was part of the Cameroon U-20 national football team during 2010 and is one of the most exciting prospects at Scorpion. Paul Betara Sarwissi and Joseph Okpwae are both fundamental to the defensive work at Scorpion while Paul Fanguargue (born 31.12.1980) provides much needed experience to this youthful side. Ismaël Mamane, a striker from Niger, has been a revelation and is the current top scorer with four goals. Patrick Naï and captain Dourwé Taoga are other important attacking players. c’est vrai le petit-là a de l’avenir à condition qu’il reste humble et se concentre au travail qu’à flaner car son quartiet s’y prete.